The action returned the Eagles Hall on Saturday night as Nemesis Fighting Alliance returned from the dead. New owners Brad Cary and Marlene Kelly took over the Jefferson County-based promotion, bringing back fights to the familiar haunt in Arnold. "It was great," Cary said. "I have nothing but great things to say. Highlights of the night, we donated over $2000 to Backstoppers, and all the fighters came out and put on a performance. Overall it was a good card. I'm overwhelmed right now." While no date set, Cary assured everyone that NFA would be back on the calendar, sooner rather than later. "We'll be back with another event this year," he said. Thirteen fights on the all-amateur card, including two exhibition kickboxing matches, filled up the bout sheet for first time matchmaker Drew Ingrande. 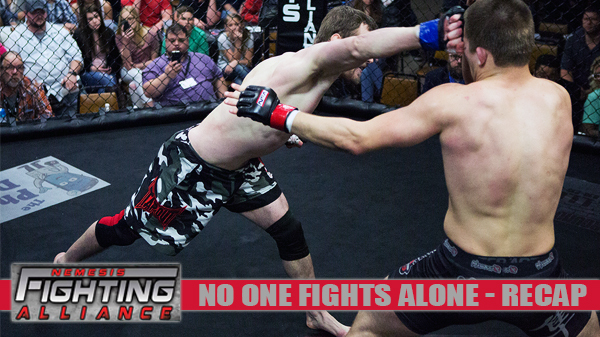 Headlining the event was a welterweight MMA bout between Chuckie Brooks and Nathan Stearns. Brooks came out fast mixing up his offense with punches, and leg kicks and Stearns looked willing to trade. Midway through the first, Brooks seemed to hurt Stearns with a series of overhand rights, triggering a takedown from Stearns. Brooks landed in Stearns guard, where he neutralized any offense from his opponent. When Stearns stood up, Brooks hit a double ankle sweep and landed in mount. From there Brooks landed punches from the top prompting a referee stoppage. Brooks has won four in a row dating back to last summer and could be a star on the rise. 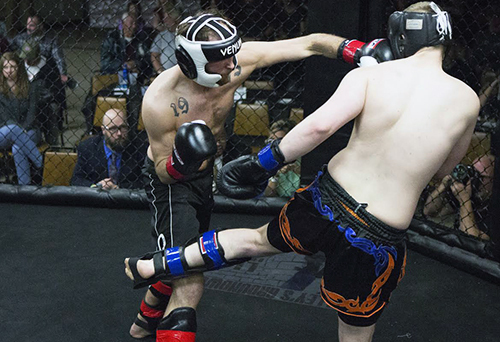 In the co-main event, Jason Newman took on Johnny Cox in a kickboxing match-up. Newman found the bullseye early and landed a vicious knee to the liver of Cox who could not continue as Newman won via TKO at 40 seconds into round one. Calvin Wiliams and Kyle Cason engaged in the classic grappler vs. striker battle. Cason looked to grind out a win on top, but Wiliams made a fight out of it. Cason scored a takedown early, but Williams hung on and was able to get the fight reset. In the second Williams did a better job keeping the fight on the feet and gave Cason real trouble with his jab. The third was close, but Cason scored a late takedown and scored points with his punches from Williams' guard. When the scorecards read, Cason won via unanimous decision. It's been a while since Tyler Madding stepped inside the cage, but he looked sharp early in his kickboxing match with Edwin Rowe. Madding landed solid punches to the gut of Rowe and even went for a takedown at one point. After feeling out the fight, Rowe went to work on the left leg of Madding. With brutally stiff kicks to the thigh, Rowe landed three consecutive, leg kick knockdowns that forced a first-round stoppage, and the victory for Rowe representing Watson Martial Arts. Chris Peterson proved flyweights can pack a punch. Peterson and Trevor Barnes both took turns on top working for submissions with Peterson attempting a guillotine from guard. Barnes took his turn, but neither was able to land the submission. In the second the two started mixing it up on the feet, Barnes charged in, when Peterson clipped him with a short hook dropping him to the canvas, a few hammerfists from top ended the fight, with Person taking home the win. It didn't take Danny Moriarty very long to take care of business on Saturday night. When the bell rang, Moriarty charged his opponent and pressed him into the cage. After softening him up with some dirty boxing, Moriarty drug the fight to the ground where he took the back and punched out the TKO as Moriarty improves to 4-0 with the win. Eric Clarkson has produced some solid ammy fighters at his River City Warriors, and Brendan Wolf might be the next. Wolf landed a big slam in the first and worked for an arm triangle for most of the round. In the second it was deja vu with a big slam, but this time Wolf went for the far-side kimura on Justin Lewis. Eventually, Wolf secured the back and won via rear naked choke, in the second. In a middleweight contest, Tim Zahner drug opponent Michael Manning to the ground, but it was Manning who settled into the better position, eventually taking the back and winning via rear naked choke in round one. David Lee and Dan Liberson came out swinging for the fences. Liberson connected first, dropping Lee to the ground forcing referee Tim Francis to wave off the fight early in the first round. In a pair of exhibition kickboxing matches, Teammates from the Wolves' Den, Sam Peneitz, and Raja Singh sparred in a friendly stand-up match. Also, form the Den teammates Lillie Breanne, and Elizabeth Nicole entertained fans in their exhibition match. Bryce Crump scored an early takedown in his fight with James Pickett, from there he landed punches on the top before stepping over into an armbar getting the tap with a first-round submission. In the nights' opening bout, Watson Martial Arts' Toshi Myatsu rallied from a one-sided first round to take the next two defeating Harrison McCormick by unanimous decision. McCormick softened up Myatsu with kicks to the body and controlled a grappling-heavy first round. In the second Myatsu landed a hip toss to put McCormick on his back where he peppered him with shots while setting up submissions. The third round was all Myatsu who locked on to an extremely deep armbar that had the crowd groaning the longer it remained on. McCormick refused to tap, and after a minute and a half defending was able to reverse and threatened with his own armbar right before the round ended.